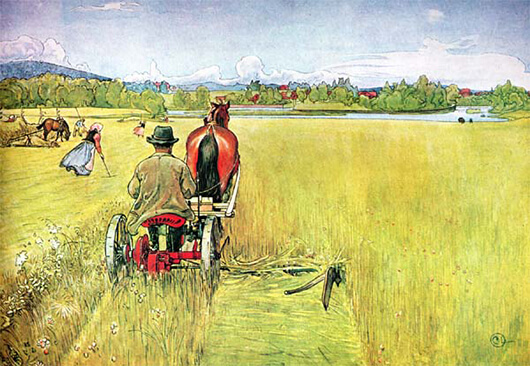 Summer, Carl Larsson (1853-1919), date unknown. The summer of my 16th year was the summer of teen-age angst. Or, as my mother would comment later, it was the summer I wanted to get away from home. Getting away from home meant heading 30 miles south to live with Aunt Jo and Uncle Bob and their four kids, my cousins, and work a decent-paying summer factory job to save up money for college. Such a rebel I was. My first 15 minutes in the wire factory were a blur of walking around as a foreman showed me the various operations. The whole thing looked scary, and I wondered what job I’d get. I also got a hint of workplace rules when the foreman glared at two women who had been chatting and said sternly, “Hey, enough talking,” as we walked by their station. When the foreman demonstrated “my” machine, I relaxed a bit. Sit on a chair, grab two sheathed electric wires from a box on my left, and place one end of each onto a plate that made up the lower portion of the boxy metal machine. Hit a button. The upper half of the machine slams down. Seconds later, the upper half automatically lifts, revealing wire ends now surrounded by molding. Yank out the finished wires, put them in the box on the right, snag two more wires from the box on the left. Repeat. The “yank out the wires” part didn’t always work, as the new molding would make the wires stick to the depressions inside the machine. That was when you picked up the long, needle-nose pliers lying nearby and carefully dislodged the stuck wire. That also was when the previous worker had bypassed the pliers and reached with her hand to extricate a wire while accidentally hitting the button that made the top half of the machine slam down. I shuddered at the thought of the grisly, painful result. Make rate? Huh? OK, I thought, these are quotas. I can do this. I looked at the sheet and the substantial number of wires I had to finish every hour. What the hell had I gotten myself into? Once he walked away, the woman at a nearby machine gave me a quick smile and nod. I smiled back then reached for my first set of wires. A couple hours later, I could see by the counter that I wasn’t making rate but I was close. I could also see how interminably, mindlessly boring this job was going to be. Finally, a loud buzzer sounded, making me jump. The workers around me actually did jump up, and they all headed to a nearby common area that contained a large picnic table. Break time! This was my first opportunity to get a good look at my co-workers. There were about 30 of them — all female. The male foremen and a few men I had seen carrying heavy boxes here and there apparently went elsewhere for their break. One small group of women who had gathered at one end of the picnic table wore transparent head bonnets and long-sleeved dresses. Amish or Mennonite, I guessed. They were a jovial bunch, laughing frequently. The other women, wearing jeans or denim stretch pants topped by T-shirts or sleeveless tops, seemed relaxed and friendly. I had barely finished the soda I’d grabbed from a vending machine when the buzzer sounded again. Nobody leapt up at that buzzer, but everyone did get up and head back to their stations. A couple hours later, feeling pleased that my counter showed I might be able to make rate at some point, the buzzer blasted again. Lunch! Aunt Jo had graciously packed one for me — homemade bread, lunch meat, chips — and I snagged it from the break room fridge. Shirley, the woman who worked on the machine to my left, motioned me to take a seat next to her. Her somber tone took me by surprise. Had I done something wrong? As it turned out, I had. I immediately understood that message. As the days wore on and my mind began to accept the tedium — take wires from the left box, place wire ends onto the molding machine, hit a button, pull wires from the machine, place wires into the right box, do it again and again and again — my body began to protest the process. One night after dinner, I let out a gasp when my shoulders were hit with a relentless, throbbing spasm. “Let me get you the mentholated rub,” Aunt Jo said as I fought back tears. She returned with a cream that smelled like wintergreen and massaged it into my shoulders and upper back. That became a nightly ritual, and it wasn’t until years later, when I first heard the term “repetitive strain injury,” that I understood the damage the factory work had been doing to my body. Breaking the rhythm of daily duties, the sociable half-hour lunch was a welcome treat. And oh, how fun it was to eavesdrop on the surprisingly bawdy talk of those Amish/Mennonite women (it seemed discourteous to ask them exactly what religion they practiced). I still remember hearing a couple of the younger women in that group estimating the size of the schlongs of various boys of their acquaintance. Who knew? Then one Thursday, half an hour before closing time, a foreman stopped by my station. “You need to come with me,” he said. I was so taken by surprise that I couldn’t even ask what was going on. The foreman ushered me to an office at the front of the building, and the boss inside stood and motioned me to a chair. My mind raced with dire thoughts. Were they raising my rate? Had I made some unintentional mistake? Did something happen to one of my relatives? “Oh,” I said, about the only response I could manage to this out-of-the-blue decree. The boss explained that I had done nothing wrong; it was a LIFO decision — last in; first out. In other words, I had zero seniority, so I was the first to go. One of the company’s biggest customers had seen its sales of refrigerators go cold, he said, so in turn it had reduced its orders for wires. My services were no longer needed. It wasn’t until I saw my now-former co-workers heading to the parking lot that my happy dance lost its bounce. Even teen-age me realized some of them might also be facing a lay-off, and the news that I had embraced could spell their economic downfall. That summer of my discontent taught me more than a year’s worth of life lessons — the push-pull of white collar versus blue collar wants and needs; the unfair division of male and female jobs; the economic reality of surviving on a paltry paycheck — all the problems a fragrant wintergreen rub couldn’t begin to salve. Originally published by Carol Schaal ’91M.A. at magazine.nd.edu on July 12, 2017.